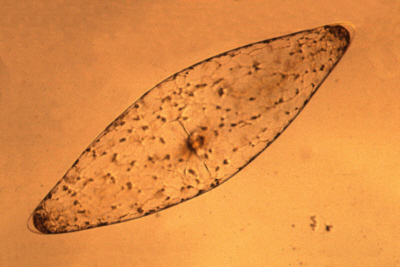 Pyrocystis fusiformis reproduces asexually (Foflonker and Cowan 2010). This means that it is able to reproduce without the fusion of gametes. This type of reproduction has many advantages and disadvantages. The advantages of using asexual reproduction are that they are able to keep the same genes and reproduce at a faster rate than those that use sexual reproduction. They are also able to expend much less energy to produce offspring while those doing sexual reproduction spend a lot of energy finding a mate, and using risky behaviors to attract that mate in the first place. There are also disadvantages to reproducing asexually. When Pyrocystis fusiformis reproduces asexually, it makes it more difficult to adapt to the environment. Gene recombination is essential because it allows for variability which is needed for adaptation. Sexual reproduction allows for the genes best suited to the changing environment to survive, but with asexual reproduction they must rely on mutations for their evolution. Pyrocystis fusiformis reproduces by making zoospores inside their cell walls where they grow as a cyst until they are able to become their own group of cells (Foflonker and Cowan 2010).This separation is done by binary division (Pincemin and Gayol 1978). The amount of time it takes for Pyrocystis fusiformis to double their population is 7 to 18 days, which compared to other species (Alpaca), it is a very short time (Pincemin and Gayol 1978). The formation and birth of the progeny through asexual mitotic reproduction means has been documented to occur usually takes place nightly, when the chloroplasts move towards the inside of the cell. (Swift and Durbin 1972). This shows that the gestation cycle for Pyrocystis fusiformis is very short. This is helpful for this organism, because it is open to predation and many other factors such as changing environments and must be able to reproduce quickly in order not to die out as a species. This organism along with other organisms follows the circadian rhythm, meaning that during the day it will go towards the surface and have the chloroplasts near the outside. This is the time when it will use photosynthesis to gain nutrients, and during the night these chloroplasts will move towards the inside of the cell, and the bioluminescent cells will move outward. Coincidentally this is also when they reproduce. When the chloroplasts move towards the inside, this allows the room towards the outside of the organism for the zoospore to form and eventually leave the parent cell (Miller 2010). Figure 1. 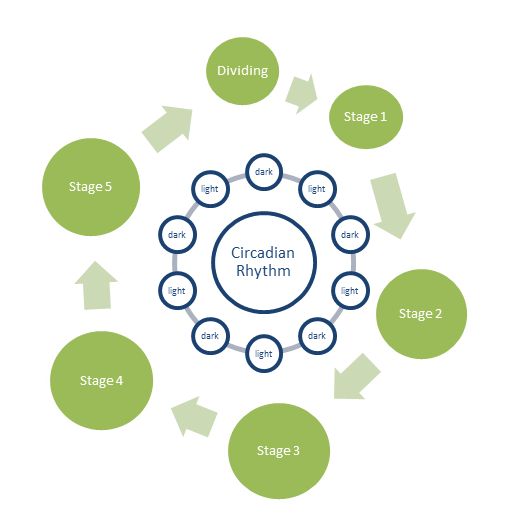 Cell cycle corresponding with circadian rhythm. The growth rate of the Pyrocystis fusiformis seems to be loosely correlated to the temperature of the water, but light availability and nutrient availability seem to not have any influence on the growth rate (Swift and Durbin 1972). This shows that temperature may be a factor on how much Pyrocystis fusiformis can reproduce; meaning that something like global warming or unusual cooling/warming of the temperature of the ocean for extended periods of time may alter the total population of this species. "Babies, babies, so many babies!" Want to know how Pyrocystis fusiformis interacts with other species? Go to Interactions.